Pointcorp’s $100 million Vida residential tower development in West End, on the fringe of the Brisbane CBD, has pre-sold more than 74 per cent of apartments within a fortnight of its release to the market. With construction expected to commence later this year, Vida will feature 148 one, two, three and four bedroom apartments, along with five bedroom sub-penthouses and luxurious two-level penthouses, designed by Cottee Parker. Pointcorp sales and marketing manager, Sam Patterson, said the response to the project has been phenomenal. “We have already issued contracts for 110 apartments for a total of $62.3 million, including two penthouses, which each fetched $3 million,” Mr Patterson said. 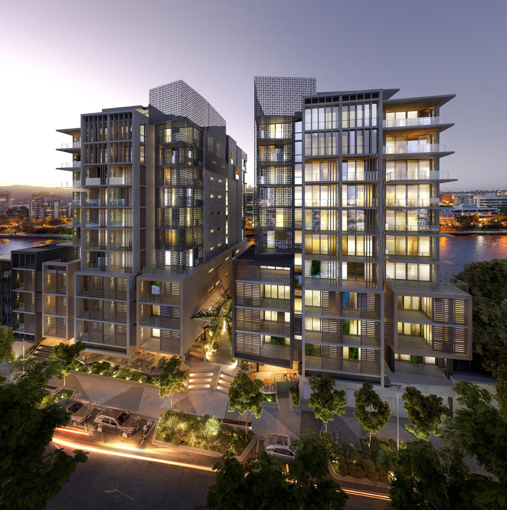 The Vida development is spread across two riverfront, 12-storey buildings located on Riverside Drive in trendy West End, only two kilometres from the Brisbane CBD. The apartments facing Buchanan Street are priced from $429,000 to $565, 000, while the riverfront apartments are priced between $760,000 and $3 million. The floor plans range from 70 square metres for a one bedroom apartment to 456 square metres for the two-level penthouses. Mr Patterson said the majority of buyer interest has come from mature couples with teenage or grown children, who are looking at downsizing to enjoy the lifestyle that comes with living in West End. “The entry level apartments have also been popular with first home buyers, who want a position close to their jobs, friends and entertainment in the city,” he said. All but four of the apartments facing Buchanan Street have sold and 34 riverfront apartments are still available in a variety of designs and floor plans. The apartments will feature exposed concrete ceilings, track lighting, American Oak timber flooring, Marc Newson tap ware, Miele or Gaggenau appliances, floor to ceiling glass and frameless glass balustrades and shower screens. One to four car parking spaces per apartment will be available to residents. Vida will also include a roof top pool, gymnasium and recreational area on each building, along with four ground floor retail spaces that will turn into an open air plaza, connecting Buchanan Street with the Brisbane river. A two bedroom display apartment is now open at 101Riverside Drive, West End from 10am daily.